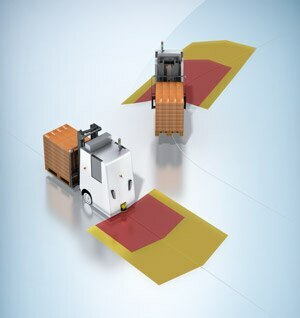 The SICK Safe AGV Forklift solves a common stop-start frustration that slows operation and leads to wear and tear of Automated Guided Vehicles (AGVs) fitting with a forklift: When the protective laser scanning fields are infringed because the forks are down, the AGV must be brought to a safe stop. Designed specifically for AGV forklifts with a drive wheel, the SICK Safe AGV Forklift integrates two SICK laser scanners providing protective fields in front and behind the vehicle, with a SICK Flexi Soft controller and a SICK encoder to monitor the speed of the vehicle. Easily incorporated into a new AGV Forklift design or retrofitted onto existing vehicles, the SICK AGV Forklift is a functional safety system designed to meet both current EN1525 and forthcoming ISO 3691-4 safety standards. Says Seb Strutt, SICK UK’s Senior Product Manager for Machinery Safety: “When the SICK Safety Laser Scanner protective field is obscured by the forks carrying a load, or during loading and unloading, the AGV can continue to proceed at a safe speed of 0.3m/sec, without requiring personnel supervision. The SICK AGV Forklift solution comprises a SICK S3000 remote laser scanner for forward scanning and S300 Mini Remote laser scanner for rear scanning, a SICK DFS60S Pro safety encoder and a Flexi Soft CPU controller with associated modules and function blocks, including a SICK Drive Monitor. The SICK S3000 laser scanner has a maximum distance measuring range of 49m, a warning field range also of 49m, and a stop protective field of 7m, and can be programmed for up to 64 different fields. The SICK S300 laser scanner has a maximum distance measuring range of 30m, a warning field range of 8m and a stop protective field of 3m. The S300 can be programmed for up to 3 fields. The SICK DFS60S Pro safety encoder is a blind hollow shaft incremental encoder, for 60mm drive shafts, certified for PLd/SIL2 safety installations. The package is completed by a SICK Flexi Soft pcu controller, with function blocks that can be selected to meet different AGV models and requirements.